The figures come at the Bank of England contemplates its first interest rate rise in a decade. Sterling fell as traders bet the data made imminent rate rise less likely. Despite September's sales fall, Kate Davies, ONS statistician, said: "There is a continuation of the underlying trend of steady growth in sales volumes following a weak start to the year, and a background of generally rising prices." The ONS said retail prices continued to rise across all store types and were up 3.3% from a year earlier, the highest year-on-year increase since March 2012. The biggest downward pressure on sales volume and value in September was in non-food stores. 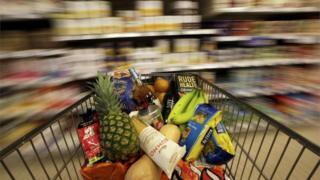 Food stores also reported falls in both measures, but to a lesser degree than non-food outlets, the ONS said. Ian Gilmartin, head of retail and wholesale at Barclays Corporate Banking, said: "It's important to avoid overstating the negatives in September's retail sales, as retailers did manage to post year-on-year growth despite the range of headwinds they are battling currently." However, he said September's fall, following strong sales in August, was "worse than predicted". Neil Jones, Mizuho's head of hedge fund currency sales in London, said the retail data was "not encouraging". The value of pound fell immediately after the figures were released, with sterling down almost half a cent to $1.3126, suggesting traders believe a rate rise next month is less likely. Bank governor Mark Carney has said rates could go up in the "relatively near term", with many analysts expecting a hike in November. Alvin Tan, currency strategist at Societe Generale, said that he still felt a rate rise next month was possible, but said a second rise early next year was now very unlikely. Ian Geddes, head of retail at Deloitte, said a November rate rise "could come at a challenging time for the retail sector". With rising inflation and increasing consumer debt, a rate hike just as the industry enters the key Christmas period would be "an additional headache for retailers", he said.